In common parlance, one of the most common types of congenital birth defects is often termed a hole in the heart. This typically refers to an opening in one of the walls separating the chambers of the heart. This condition was in the news recently when the elite Danish swimmer Pernille Blume had an operation to repair a hole of this type after suffering a minor blood clot. 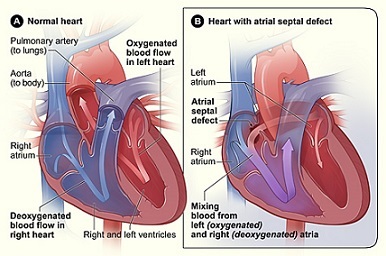 The Danish heart organisation Hjerteforeningen estimates that as many as one in four people are born with this condition that normally rights itself when we are born, reports TV2 Nyheder. Most people never notice any side-effects so are unaware that they even have the condition, explains Anne Kaltoft, heart specialist and Hjerteforeningen’s administrative director. It is only when a patient is hospitalised with a blood clot that seems to have appeared for no good reason that a hole in the heart might come under suspicion. The hole can contribute to a small lump of blood naturally present in a vein ends up in the wrong place. Normally it would be washed out but because of the small hole between the heart’s chambers, it can end up in the bloodstream and from there, be pumped up to the brain and cause a thrombosis. The good news is that a simple and painless operation can close the hole that is done under local anaesthetic.